A telescope bigger than our planet reveals minute details in a nearby galaxy’s center. 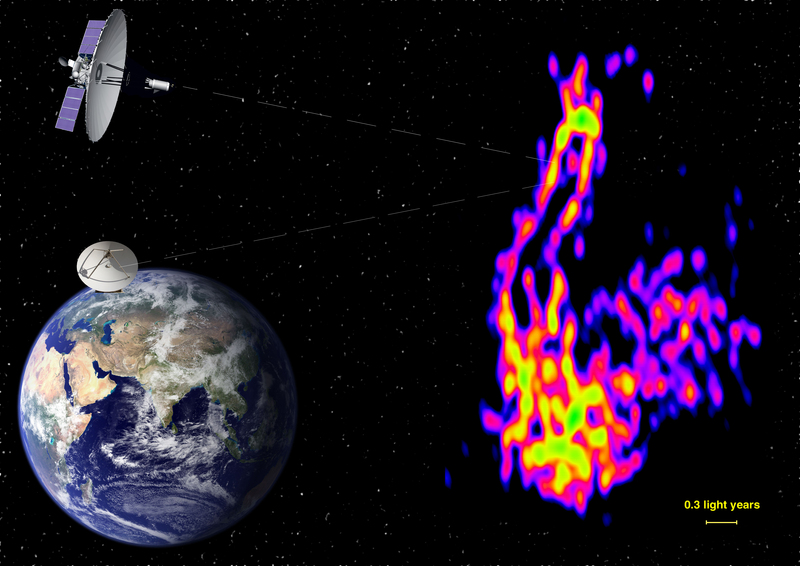 This image shows how radio telescopes on Earth and in space (left) combined to observe a very small region around another galaxy’s supermassive black hole (right). In this radio image, the black hole is located in the bright yellow-green spot at the top; a young jet about 3 light-years long shoots away from the black hole. Pier Raffaele Platania INAF/IRA (compilation); ASC Lebedev Institute (RadioAstron image). Supermassive black holes millions to billions of times the mass of our Sun lurk in the centers of most galaxies. In addition to feeding on nearby gas and dust, some of these black holes launch massive jets of plasma that not only dwarf the black hole itself, but the entire galaxy in which they reside. The mechanics of these jets, including exactly where they are launched, are still poorly understood, but observations such as those recently achieved using a combination of Earth- and space-based radio telescopes will help unlock the mysteries surrounding these dramatic structures. In a paper published April 2 in Nature Astronomy, an international collaboration of astronomers released observations of the jets around the black hole in the galaxy NGC 1275, located in the Perseus Cluster of galaxies about 230 million light-years away. Also known as Perseus A or 3C 84, this galaxy is classified as a Seyfert galaxy, meaning it has an “active” black hole currently feeding on surrounding material. That black hole is in the early stages of generating massive jets, which have now been mapped out via radio observations down to a mere 12 light-days from their origin around the black hole. That’s just a few hundred times the radius of the black hole itself (1 light-day is about 16 billion miles [26 billion kilometers]). What they found surprised them. “It turned out that the observed width of the jet was significantly wider than what was expected in the currently favored models where the jet is launched from the black hole’s ergosphere — an area of space right next to a spinning black hole where space itself is dragged to a circling motion around the hole,” said the paper’s lead author, Gabriele Giovannini from the Italian National Institute for Astrophysics, in a press release. Instead, “this may imply that at least the outer part of the jet is launched from the [much larger] accretion disk surrounding the black hole,” said said Tuomas Savolainen of Aalto University in Finland, and leader of the RadioAstron observing program that created the images. These images took advantage of a technique called very long baseline interferometry, or VLBI. This technique links several radio telescopes together to essentially observe with a “virtual” dish as large as the distance between the telescopes. In this case, the team linked Earth-based radio telescopes with a Russian 10-meter (33 feet) radio telescope orbiting Earth as part of the RadioAstron project, creating a virtual radio telescope with a diameter of over 200,000 miles (350,000 km), nearly the distance between Earth and the Moon. The larger the radio telescope, the finer the detail it can see, which allowed astronomers to zoom in on the region around NGC 1275’s black hole to look for clues about how and where the jet is generated. Their resulting images are 10 times better than anything previously achieved using ground-based radio telescopes alone. This same technique is the one utilized by the Event Horizon Telescope last year in an attempt to image the shadow of a supermassive black hole on its accretion disk; astronomers are eagerly awaiting the results, which should be announced later this year. But while these observations don’t mesh exactly with expectations, “Our result does not yet falsify the current models where the jets are launched from the ergosphere, but it hopefully gives the theorists insight about the jet structure close to the launching site and clues how to develop the models,” said Savolainen. 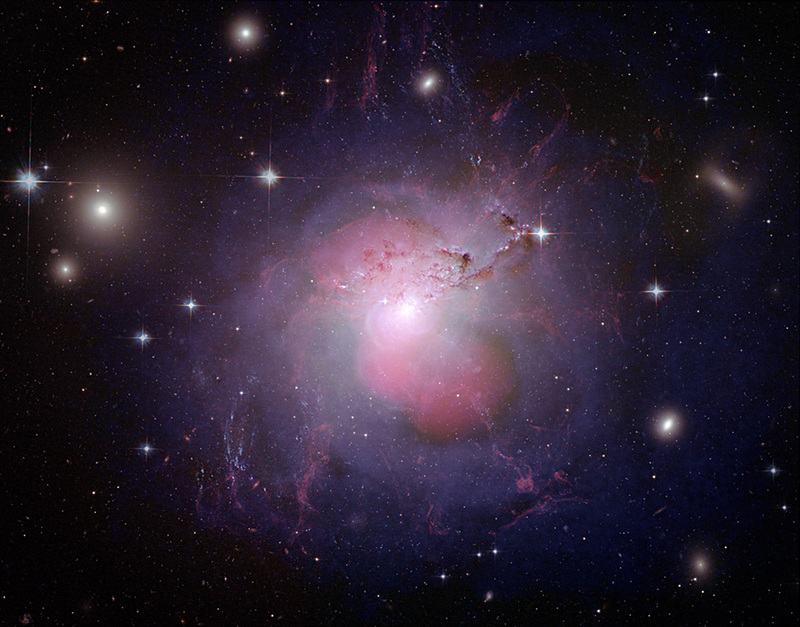 The galaxy NGC 1275 contains the black hole around which jets were imaged in this study. This composite image shows detail from optical, radio, and X-ray observations. The purple X-ray lobes near the brightest part of the galaxy contain the young radio jets from the black hole.